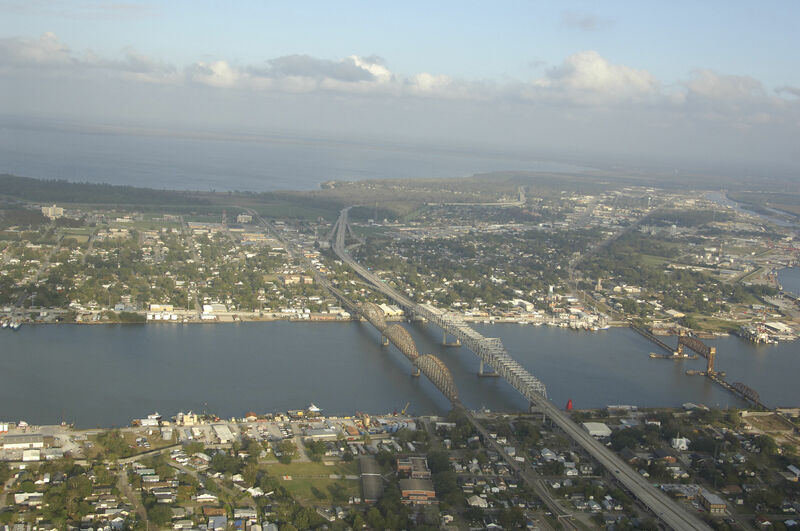 Morgan City is situated off the Lower Atchafalaya River near its confluence with the Gulf Intracoastal Waterway (GIWW) at Mile 96. Morgan City is about 70 miles west of New Orleans and south of Baton Rouge by about 60 miles. 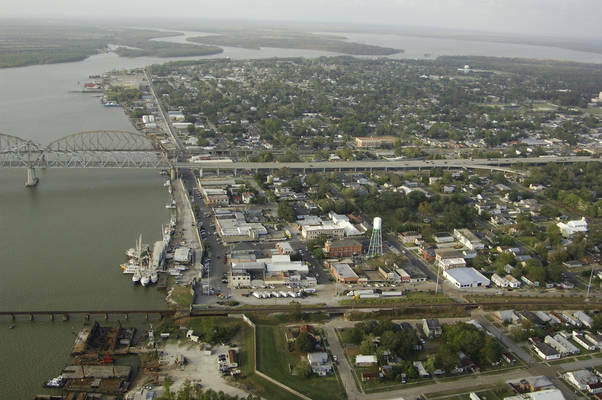 The Morgan City waterfront is the heart of city life and where most of the marinas, marine, restaurant, and provisioning facilities are located. The image above is a view from the north looking south over the confluence of the GIWW and Lower Atchafalaya River. 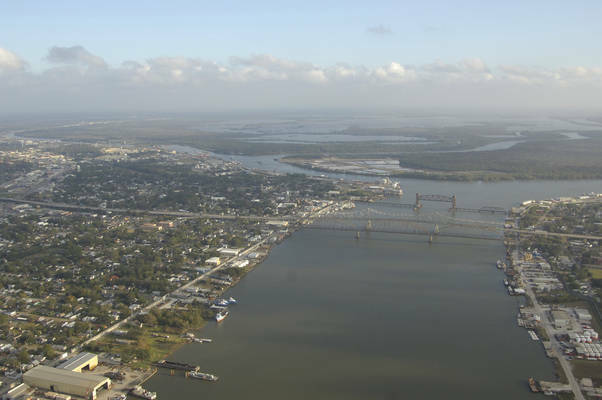 Note the three bridges (two fixed, one lift) that cross the river on the south side of Morgan City. The Morgan City waterfront and its numerous shrimp vessels are located on the left (east). 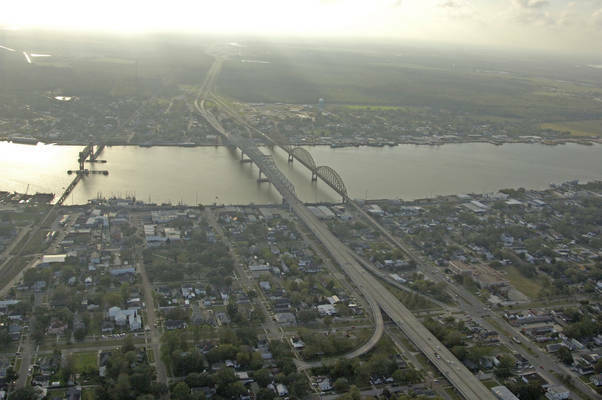 There are three bridges that cross the Lower Atchafalaya River as you proceed northward toward the center of Morgan City. First is a railroad lift bridge (four-foot closed vertical clearance, 73 feet up) that is usually left in the open position unless rail traffic is approaching. Next are a set of two fixed bridges, the first of which has a 73-foot fixed vertical clearance, and then the Long Allen Fixed Bridge with a 50-foot fixed vertical clearance. Aside from taxi cabs, there is no local organized public transportation in Morgan City, although there are a few car rental facilities in town if you want to explore surrounding areas such as New Orleans or Baton Rouge, or make a trip to the New Orleans (Louis Armstrong) International Airport. For detailed flight schedules and information for the New Orleans International Airport, see our Helpful Links section below. No reviews yet! Be the first to write a review of Morgan City.